The strawberry, a member of the rose family, is unique in that it is the only fruit with seeds on the outside rather than the inside. Strawberries have been known since the time of the Greeks and Romans and cultivation of strawberries began in 1624. Commercial growing in America began about 1800 on the east coast of the United States. Strawberries moved west with the pioneers and now there are more than seventy varieties of strawberries, many of which are grown in California and Florida. This familiar fruit is usually available fresh year round with a peak from April to July. Selection. Look for bright red berries with fresh green caps on. When you remove the caps you tear cells in the berries, activating ascorbic acid oxidase, an enzyme that destroys Vitamin C. Visually check each package, making sure there are no signs of mold growth. If one berry is molded, mold spores will have traveled throughout the entire package. Research has linked mold to some forms of cancer, always avoid moldy berries. When purchasing strawberries by the pound, one-and-a-half pounds equal one quart. This will yield about four cups of sliced strawberries. Handling & Storage. Use strawberries as soon after harvesting or purchasing as possible. Refrigerator storage does not improve the quality of fresh strawberries. Berries should not be left at room temperature for more than a few hours. Before handling the strawberries, wash hands with soap and warm water for 20 seconds. 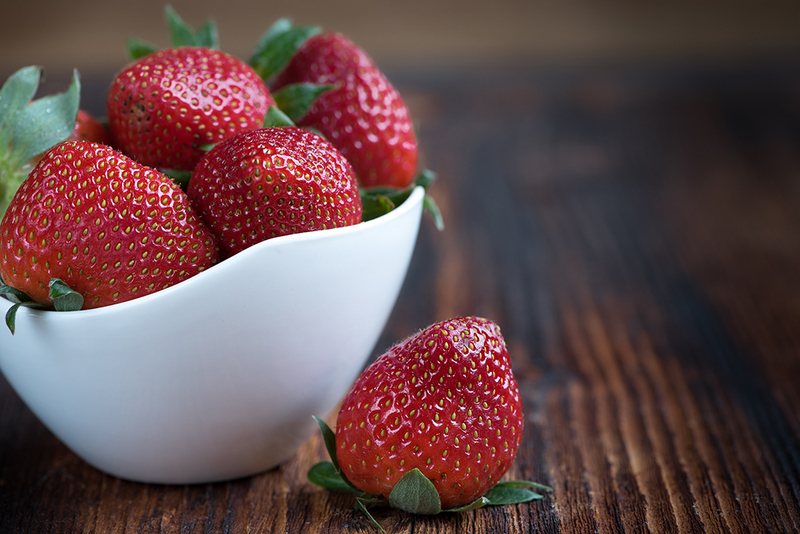 To wash the strawberries, place the berries in a colander and rinse under cold running water. Do not allow berries to set in water as they will lose color and flavor. After washing, remove the green cap with a plastic-tipped vegetable peeler or paring knife without removing any of the fruit.